"We own our updates and I'm ultimately the one responsible." I can't wait for it to start, but at the same time, I'm nervous as hell. In just under two weeks time, I'll start a journey that excites me but also gets me a bit nervous. It's a lot of responsibility, but I feel I'm ready. I'll make a lot of decisions that impact others and that weighs heavy on my shoulders. I don't want to disappoint anyone, while I know, that's not always possible. On May 26, I'm getting married. If everything goes according to plan, the love of my life is going to say yes and we'll live together happily ever after. On May 29, I'm flying to Vegas to lead the PokerNews.com Live Reporting Team that's going to cover the 2017 World Series of Poker. Both dates get me excited; both make me nervous. In this blog, I'll focus on the WSOP project; it's PokerNews.com you're reading, not TheKnot.com. If you want to talk about wedding cakes, wedding dances, rings and what not, you'll know where to find me for the coming eight weeks. It's PokerNews.com you're reading, not TheKnot.com. Last March, PokerNews and the WSOP announced a renewed partnership. It was as simple as putting out a press release and creating an article, and the world knew. For me, it meant a little bit more. This deal had been in the works for quite some time and I had already started contacting a lot of reporters. As Global Manager of Live Reporting for PokerNews.com, it was up to me to make it all reality. That might seem simple, but it's not. It really isn't. I started by putting out a questionnaire to every single reporter I knew in the business. At the same time, I created an Excel file with the complete WSOP schedule in there, to get a feel for how many reporters I needed. Soon enough I started talking shop to a whole lot of reporters. Some of them had worked the WSOP before, some hadn't. Every single one of them had different preferences, different games they mastered, and different availability. Some are staying with other reporters, so it might come in handy to put them on the same days so they can share a ride. And of course, everyone needs days off. It was the biggest puzzle I ever started. Fortunately, most reporters who are on board have covered the World Series of Poker before, either in the last two years for the WSOP or before with PokerNews. Every reporter will tell you that the WSOP is a different beast than any other poker tournament in the world. It's seven weeks straight of work. It's long days, and there are games to be covered that aren't on offer at any other poker tournament throughout the year. That makes it a unique challenge for all of us, but an interesting one at that. The coming weeks are going to be busy for me. While I have absolute faith in the PokerNews team, mistakes are going to happen. We're going to write down thousands and thousands of hands; we're bound to make mistakes. We're going to write down thousands and thousands of hands; we're bound to make mistakes. One suit wrong can make your play brilliant or as terrible as they come. One zero missing from your chip count and you might appear busted while you're sitting comfortably. I know this, and it's a huge responsibility. Please, when this happens, inform us and we'll be amending the posts. Also, download and use the MyStack app. With the app, you can update your count yourself, so even if there's a mistake made by one of our reporters, you can correct it. I've made mistakes in the lead-up to the biggest project of my life. I'm going to make more in the coming weeks. That's inevitable. For me, accountability is the most important thing. We own our updates, and I'm ultimately the one responsible. So if there's something that's on your mind, find me in the Rio. Tweet @PokerNews or @Webjoker, or just shout out 'Frank!' really loud, and I'll be there. I'll be in the Rio just about all the time, so I'm never far away. If there's a mistake made by one of our reporters, you can correct it. 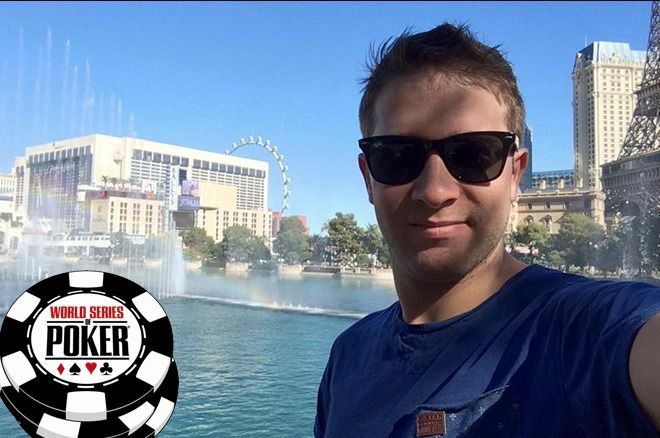 I'm honored to lead the PokerNews.com Live Reporting Team. Fortunately, I have a strong team of reporters to work with. For me, covering the World Series of Poker is about the players in the Amazon, Pavilion, and Brasilia (and Poker Room, Miranda Buzios, and other rooms in the building if needed). It's about the fans at home that stay up-to-date through our updates. It's my 10th year doing it, but I'm still excited. The 2014 World Series of Poker Asia-Pacific is Underway!